Required by many venues, Tony Murphy Mobile Disco has a current PLI policy with Mobile DJ Network in the amount of £10 million. Also required by many venues, Tony Murphy Mobile Disco has not provided satisfactory evidence of having current PAT records available. A Method Statement, outlining Tony Murphy Mobile Disco&apos;s Health & Safety procedure for setting up disco equipment has not been supplied. Why do people choose to book Tony Murphy Mobile Disco? Pleased with quote and what was offered in the price. "Everything went great on the night. Everyone was pleased with the DJ and the music. Photos were taken by Tony which were great !!!! Would recommend again !!! " "Tony was fantastic we had a range of ages at our party and he catered for them all. The pictures I sent him were shown on the screen supplied by Tony, family and friends have already asked me about booking Tony in the future. I will definitely use him again. Thank you Tony for making the party a little more special"
" Amazing dj, catering for all of my guests, will defo be recommending and booking for any other events"
Tony Murphy Mobile Disco also offers a range of additional party services not directly linked to musical entertainment. 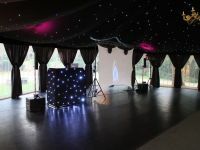 Get FREE no-obligation disco quotes from Tony Murphy Mobile Disco and other DJs covering your venue. Take 2 minutes to fill in some basic details and we'll do the rest! If you are contacting Tony Murphy Mobile Disco about an event, it's always a good idea to include the DATE, LOCATION, EVENT TYPE, AGE GROUP and TIMINGS to speed things up!